This bezel centered design is modern in its approach, with a vintage flair in the addition of three flanking diamond details. This design can be created with a 1/ 2 ct brilliant cut diamond. The band is 1.5 x1.5mm and flanking stones are 1.5mm each. 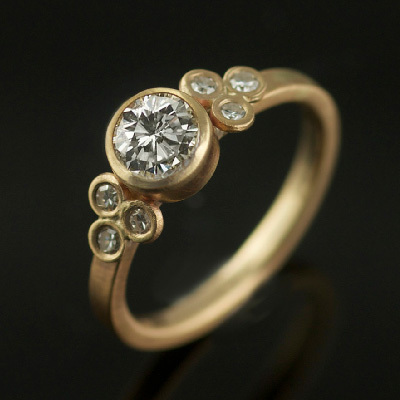 Each design in this collection sits flush in a stack of rings or next to a wedding band. This piece is made-to-order, please choose your ring size, diamond size, and metals. Creation time is 4-5 weeks.